Elapsed time is a concept that just seems to be one of those that kiddos struggle with.Though they seem to master elapsed time when it's within an hour pretty quickly. Say it's a problem like Sally started her homework at 4:20. She worked for 28 minutes. What time did she get finished? THAT's failry easy for them. But when it comes to situations where the time elapsed is over an hour....it gets a little sticky. And I mean sTiCkY! One of the first things we talk about with elapsed time is how it's almost like the hour hand is doing 'laps' around the clock face. We talk about how the minutes around the clock can be thought of as a number line...imagine there was a number line tape that went around the clock that we could pull off & lay flat in front of us. Of course, it's also continuous...once we get to 60, it starts back at 1 all over again! 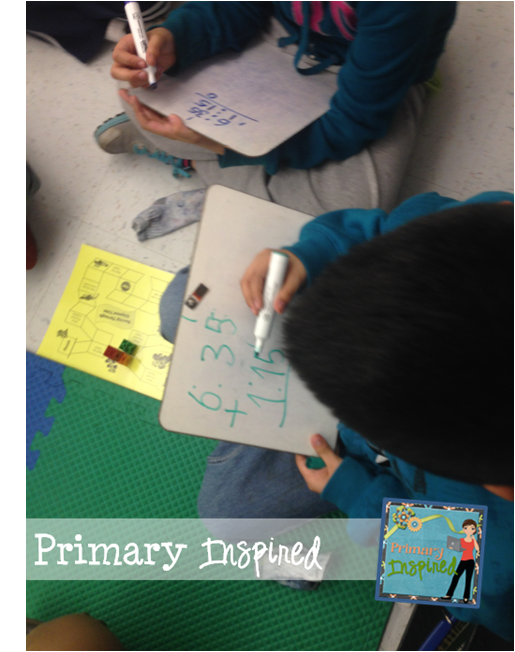 We've got those ideas, but figuring out elapsed time continued to be a struggle. You all know that I am a firm believer in the power of games in instruction. 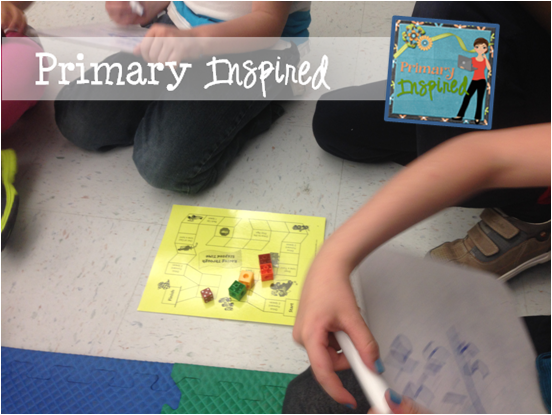 I love, love, love using games in the classroom! 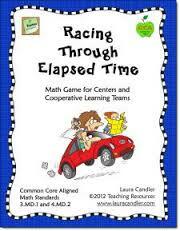 So-- I went on the search....I was super excited when I came across Laura Candler's Racing Through Elapsed Time! Perfect!! Know what makes it even better? It was super easy & QUICK to get it all prepped, set up, & ready to go! Included in the pack, of course, is the gameboard and game cards. I was at school (no color printer), so I printed it out, copied on colored cardstock, laminated, and we were good to go! All I had to add for the workstation was a die, some game pieces (you can see we grab unifix cubes for that). Easy, peasy! One thing that I especially like is that it is a game in which ALL the players are involved - no one person at a time takes a card while the others wait. 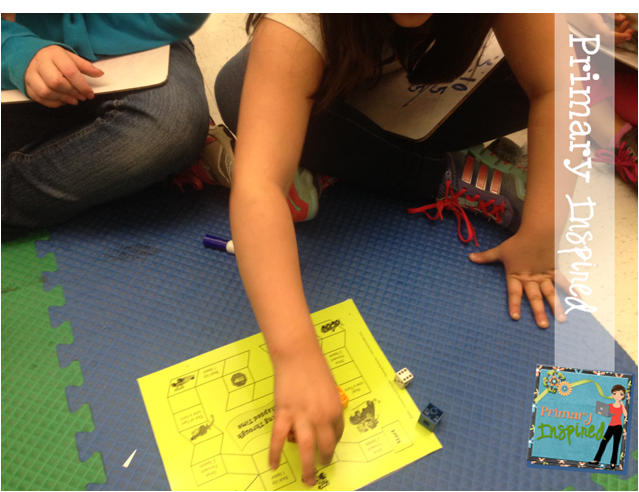 The leader reads the game card, and ALL students work on the problem on their whiteboards. Those who got the correct answer roll the die & move their game piece. (How brilliant is that!? I'm not sure that I've ever seen a game where ALL of the kiddos were working all the time! Brilliant) You can see in the picture to the right that they're working at the same time. Of course, THE most important thing is that it was effective! I noticed as we continued playing that the kiddos were becoming more and more comfortable working on elapsed time questions (and that they were coming up with the correct answers more frequently and more quickly! Win! Win!). In fact, one of my kiddos actually said, "Hey! This is getting pretty easy!" True story! Just click on the link below to head over & check this out for yourself!